The BioSuite is a custom-built facility for BrisSynBio that supports microbial cell culture and protein production. It will allow you to design experiments that include high throughout molecular biology, protein production, fermentation, structural biology, assays, and library generation. Liquid handling robots for molecular biology, protein production and assays. Liquid handling robots for biophysics and assays. These permit multi-parallel cloning and protein expression screening in a high-throughput manner. The robots facilitate PCR amplification, product purification, ligation, DNA extraction and plasmid transformation along with microbial cell culture in a 96 well plate format. This allows screening for protein expression and solubility and for culturing strains for metabolite extraction. Autoclaves for the sterilisation of microbial culture media. Refrigerated shakers / incubators for fermentation scale-up. These will be used for microbial cell culture to prepare DNA (genomic, plasmid, cosmid, PACs/BACs, etc. ), RNA, for recombinant protein/peptide expression, and culturing microbial isolates/hosts for metabolite extraction. 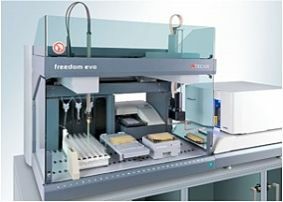 High pressure chromatography workstations. These can be used for the purification of significant quantities of recombinant proteins. A liquid handling, protein crystallography robot, optimised for sitting and hanging drop vapour diffusion experiments on the nanolitre to microlitre scale, supporting microseeding, additive screening and co-crystallisations. In addition, the BioSuite is supported with a dedicated manager who provides training, oversees access, assists users with experiment design and implementation, and can develop methodology for bespoke applications when required. The BioSuite is housed in Biochemistry, with a "consumables-only" charging model. BrisSynBio users are welcome to book our equipment. Please contact us (brissynbio-equipment@bristol.ac.uk) for more information about this equipment.